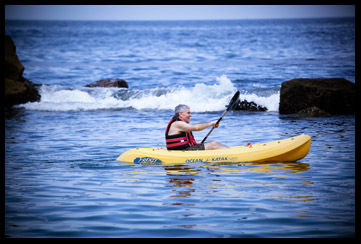 "The Adventure Kids" aka Debra C. Argen and Edward F. Nesta, have another great adventure, learning to paddleboard at Costa Sur Resort & Spa in Puerto Vallarta, Jalisco, Mexico. After spending a morning learning technique, we can say that the sport of Paddleboard, or Stand-Up Paddleboard, is fun, challenging, a great workout for the "core," and something that we cannot wait to do again. Thrill seekers and adventurers that we are, we are always looking for a new adventure to experience. As water babies, we love to scuba dive, snorkel, surf, and kayak, however we had yet to try paddleboard, a sport which is on the rise. 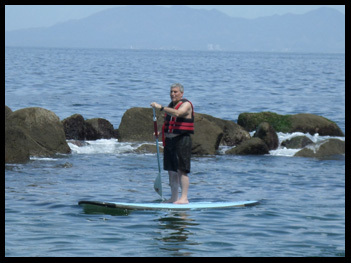 During a trip to Puerto Vallarta in late April 2014, we decided to add another sport to our growing list of adventures and took a paddleboard lesson at Costa Sur Resort & Spa, located in the Zona Hotelera Sur (South Hotel Zone). Although we were not staying at the hotel, the hotel offers an Adventure Day Pass where visitors can spend the day at their facility and play with their "toys." The Day Pass provided us with the opportunity to take a paddleboard lesson, as well as snorkel and kayak, and we took full advantage by doing all three in water so clear and plentiful with tropical fish that it can be best described as a natural aquarium. As an introduction, a paddleboard is like a large foam covered surf board which you stand up on and use a paddle to glide over the water. Paddleboards range in length from 10 feet 6 inches to 12 feet with a width range from 32 inches to 34 inches. I had a paddleboard lesson with Activities Director Jose Garcia, while Edward took a kayak out for a ride while waiting for his paddleboard lesson. My lesson began on the sand, where I learned proper stance on the board. Unlike surfing where one foot is placed ahead of the other, on a paddleboard the feet are placed parallel, facing forward at shoulder or hip distance over the middle of the board and without touching the "rails," paddleboard lingo for the edges of the board, with my knees slightly bent. I learned to keep my head upright and steady, gaze forward and not look at my feet, because as in car racing and golf, where you look is where your car or ball, or in this case, the paddleboard will go. Next, I learned how to shift my weight using my hips rather than by turning my upper body which would be a natural instinct. As paddles are adjusted to height, Jose helped me to make the necessary adjustments, and then I learned how to paddle by alternately sweeping "the water" at either side of the board. There was one more step I needed to learn before I could progress from training on the sand to the water, I needed to learn how to enter the water, kneel on the board while holding the paddle in my right hand and then stand up on the board. After a few run-throughs on the sand, Jose deemed I was ready to transition what I learned on the sand to the water. I donned my life jacket and Jose carried the paddleboard into knee deep water, where I kneeled on the paddleboard and held the paddle in my right hand as Jose gave the board a push to set the board in motion and gave me the instruction to stand up on the board. Although I had practiced this move on the sand, standing up on a paddleboard in the Pacific Ocean and encountering the slight waves of the lagoon was a bit trickier than on the sand, but I managed it with ease, and started paddling. As a beginner making my maiden paddleboard debut, I started out by very slowly paddling which unfortunately was not the best approach, as you gain stability with smooth, continuous movement. I soon realized this, and started to build up cruising speed, and was moving along with ease. Old habits die hard though, and as I surf, I had to make a conscious effort to keep my feet in the proper paddleboard position and not go into "surfer stance," which meant that I spent a considerable amount of time at the beginning looking at my feet in the wrong position, and trying to correct my stance, which created a very shaky board until I learned to settle into the rhythm and keep my feet where they belonged. Even though Jose had told me to keep my head upright, focus on the horizon, and keep the board in motion, oftentimes the temptation of looking at the stunning scenery of the lagoon and watching the pretty tropical fish swim by my board overcame my better judgment and I had to look down and watch them. I quickly learned that standing with both of my feet on the rails on the same side of a paddleboard is not possible, and went from "the thrill of victory" to falling off into the water where I had an excellent view of the fish, and Jose rushing out to me in a kayak should I need his assistance. 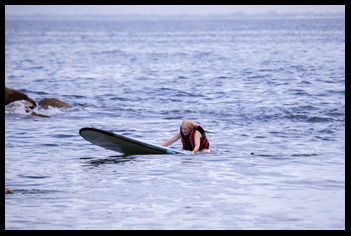 However, as my goal was not swimming with the fish, that would come later, but rather paddleboarding, and the fact that I am an "Adventure Kid" and determined, although I fell off the board in deep water, I pulled myself right back on the board, never lost my paddle, and stood right back up and started paddling. Although paddleboarding looked so easy as I watched others gracefully gliding over the surface of the water with not a hair out of place, I knew that for me, this would require some concentrated effort. Humbled, I paid more attention this time, keeping my feet in the proper stance, looking straight ahead, and rhythmically paddling from side to side. I was feeling confident, skillful, and comfortable as I deftly maneuvered the paddleboard the length of the lagoon, going around the swimmers, snorkelers, and kayakers, with only an occasional glance at the tropical fish swimming below me, and I was feeling quite proud of myself and my progress. So confident was I that I had now ventured a little too far, and rapidly approached the rope that marked the end of the lagoon and the beginning of the open ocean. As the nose of my board passed over the demarcation rope, I imagined myself confidently gliding over the waves of the Pacific Ocean, and then reality hit and I thought, "Am I crazy? Here I was in the sheltered lagoon and I was having trouble and I was contemplating going further out?" I tried to slow the board's progress by dragging my paddle with the hope that I could paddle turn the board around, and then when that was unsuccessful, rather than tempt my fate paddling in the open waters, I deliberately fell off the side of the board so that I could kick turn it around and then climbed back on again and started paddling again in the right direction. This time onboard, I did everything exactly as Jose had instructed, and I had the ride of my life. I thoroughly enjoyed my paddleboard experience and know that this is definitely a sport I would like to do again. After cruising out of the lagoon into the open water and kayaking around for awhile, and watching Debra's attempt to paddleboard, I felt it was time for me to venture back and show her how it was really done. Having watched Debra's beach time paddleboard schooling, I had a quick session with Jose and he felt comfortable that I would master the paddleboard without dropping into the water. So, I pushed off, hand paddled out and slipped the board under my feet and bounced up to catch my balance and enjoy my first paddleboard experience. I felt comfortable and started to gain my balance and move away from the beach while paddling what I thought was smooth equal strokes while looking cool. 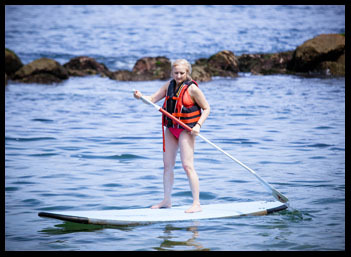 Alas, I looked very cool as I took my first plunge off the paddleboard and into the beautiful, warm, and inviting water. 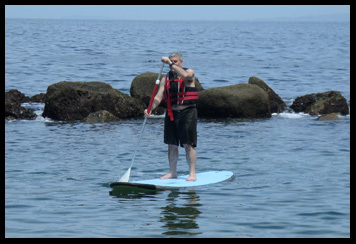 Not discouraged and hearing calls of support from the shore, I grabbed the paddleboard and climbed back on and I was ready to master the "foam beast," which I did for a few minutes before taking another refresher in the water. Though I did take three breaks in the water, hey it was sunny and warm, I did take control of the board. Once I took control, it felt like I was floating on the water as I smoothly moved along the waves. I learned that I needed to get into a rhythm of moving the paddle from one hand to the other while performing smooth pulling strokes from the front of the board back to my feet and then swap hands and paddle on the other side. Once I got into the rhythm it was fun. In the end I was informed that I took three plunges while Debra only had two drops into the water, thus proving that I needed to take more water breaks as I was working up more of a sweat. After our morning's playtime, we had an excellent lunch on their Sunset Terrace; just another wonderful day in the paradise that is Puerto Vallarta. Read about our dining experience at Costa Sur Resort & Spa in the Restaurants section and get a tasty ceviche recipe from Chef Alejandro Vega in the Chefs' Recipes section. Please read other articles on Puerto Vallarta, Mexico in the Destinations, Hotels and Resorts, Restaurants, Spas, Chefs' Recipes, and Gastronomy sections. © June 2014. Luxury Experience. www.LuxuryExperience.com All rights reserved.